John Dewey famously described art as experience—emphasizing that not only the aesthetic artifact but the entire process, which unfolds over time, makes art so vital. Dewey writes, “Works of art are the most intimate and energetic means of aiding individuals to share in the arts of living. Civilization is uncivil because human beings are divided into non-communicating sects, races, nations, classes and cliques” (1934, 336). Dewey was equally committed to experiential education, so much more aligned with democracy and the individual’s proactive discoveries than a one-way authoritarian model of learning. My touchstone for an art experience whose profound educational impact emanated from its whole process, took place when I was 21, co-facilitating a theater workshop in a men’s maximum security prison. To say it produced knowledge does not capture its impact, shaking me to the root of my being, making me realize that I carried unexamined notions about who is incarcerated. We went deeper than our skin, and revealed things about ourselves we’d never have shared in “ordinary” encounters. This seems to me an example of Dewey’s “arts of living.” The plays we made gave form to aspects of our experience that resonated with and stretched the inmate audiences and makers alike. Years later, I applied how I had learned in the prison theater workshop—through art’s capacity to deepen relationships over time and allow people kept apart to know one another—to how I taught theater students. It’s an approach familiar to many who do engaged art, humanities, and design. Expanding our students experience and complementing their book learning with hands-on, in-the-world learning inspires them to go back to books in order to probe deeper, which in turn arms them with more tools to go back out into the world. We desperately need experiences that allow us to know not merely the facts about people who are in different situations from us, but also their hearts and aspirations, fears and wounds, and mechanisms of survival and resistance. I feel a resonance with 2016 McArthur Award winner and African American poet Claudia Rankine, in her desire to found a Racial Imaginary Institute: “When white men are shooting black people, some of it is malice and some an out-of-control image of blackness in their minds” (2015). If ideas about race often take root in our imagination rather than as a result of our lived experience, because of de facto segregation, do we not need experiences that shift those perceptions? Think of this issue of Public as a story circle with contributors responding to the prompt, “Tell a story of an experience involving art that generated new knowledge.” In the Front Matter, choreographer/thinker Liz Lerman unpacks artistic methods as tools, including her marvelous-in-its-simplicity insight that the very shape that participation takes in a circle—the norm in many a performance workshop—sets everyone up as equals, reinforcing that we all have much to give and receive whatever our pedigree. Then numerous contributors honor our late, beloved colleague Randy Martin, whose life epitomized the intertwined threads of making art, producing knowledge/scholarship, being an active citizen in the political world, and teaching. Kathy Engel and David Dorfman each pay homage to Randy as a dear friend and colleague, emphasizing lessons both obvious and subtle that they learned from him. Bruce Burgett revisits an interview that he and several colleagues conducted with Randy, published in the journal the two of them cofounded, Lateral, opening the piece to four additional artist/scholars who dig into selections from the original text in retrospect. Randy, thank you for bringing attention to many different ways of producing knowledge in the world, and many kinds of people who do so. And thank you for your loving kindness. The section Principles and Practices begins with Peter O’Connor and Michael Anderson’s conception of applied theater as a form of participatory action research. It does not simply reflect the way the world is, but is a potent tool to help communities consider what they might become. Anthropologist Katinka Hooyer, grounded in objective science, affirms the subjectivity art brought to her work with veterans, teaching about social difference in a manner that nurtured empathy and compassion amongst participants and promoted healing. Art historian Elizabeth Grady argues for the importance, and frequent invisibility, of the duration of knowledge-generation set in place through an art project. Joe Osmundson uses an installation by Simone Leigh to reflect on how art can function as medicine. In Case Studies and Resources, Amy Shimson-Santo shares how art and design both contributed to youth learning and reflected the youths’ understanding of LA’s transportation system. Anne Basting and Casey O’Brien describe an intergenerational project that used Little Women to inspire an arts-based look at changing ideas about gender. Lindsay B. Cummings and Inmaculada Lara-Bonilla describe the impact on students of not just the production of a musical linking people of joint Latino and Appalachian heritage, but also the opportunity to talk with people involved in making it. 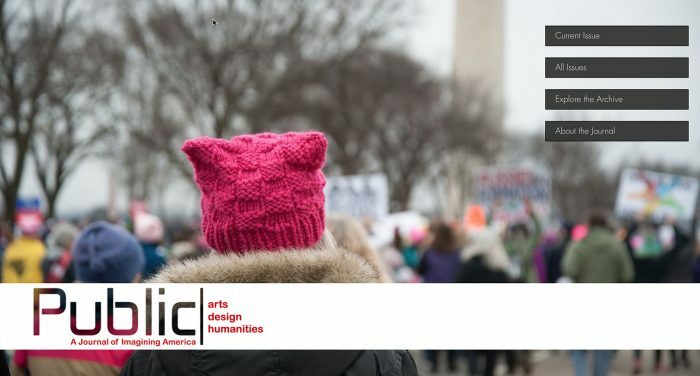 The issue is rounded out with two reviews: Richard Alomar on Community Matters: Service-Learning in Engaged Design and Planning, edited by Mallika Bose, Paula Horrigan, Cheryl Doble, and Sigmund C. Shipp; and Aimee Cox on Camille Brown’s dance piece, Black Girl: Linguistic Play. Taken as a whole, this issue endeavors to express that knowledge creation through art-making is a multilayered, multisensory, multidimensional experience and that knowledge producers are more diverse than generally acknowledged. The articles challenge the notion that aesthetic practice is supplementary to knowledge production. And they are an antidote to the Gandhi saying that he was saddened by the hardness of heart of educated people. This brings us back to Dewey’s notion of the arts of living, which take place with more than just our minds. This marks my last issue as senior editor of PUBLIC, which I cofounded with Kathleen Brandt and Brian Lonsway. I thank Aimee Cox and Kim Yasuda for thinking this issue through with me. I am grateful to the many people who have made the journal possible, including the members of the editorial board and the staff: Judy Susman for her thoroughness as copy editor, Lynn Wilcox for her lovely layouts, and Suzanne Preate for her steadfast kindness and professional expertise as digital editor. It’s been an honor to contribute to engaged scholarship through generating Public. I thank all those at Imagining America who believed in my capacity to shepherd this initiative. Dewey, John. 1934. Art As Experience. New York: Minton, Balch & Company. Rankine, Claudia. 2015. “Blackness in the White Imagination Has Nothing to do with Black People,” The Guardian, December 27. https://www.theguardian.com/books/2015/dec/27/claudia-rankine-poet-citizen-american-lyric-feature.